Ugali is an East African dish (also sometimes called sima, sembe, or posho) which is a cornmeal product and a staple starch component of many African meals, especially in Eastern and Southern Africa. 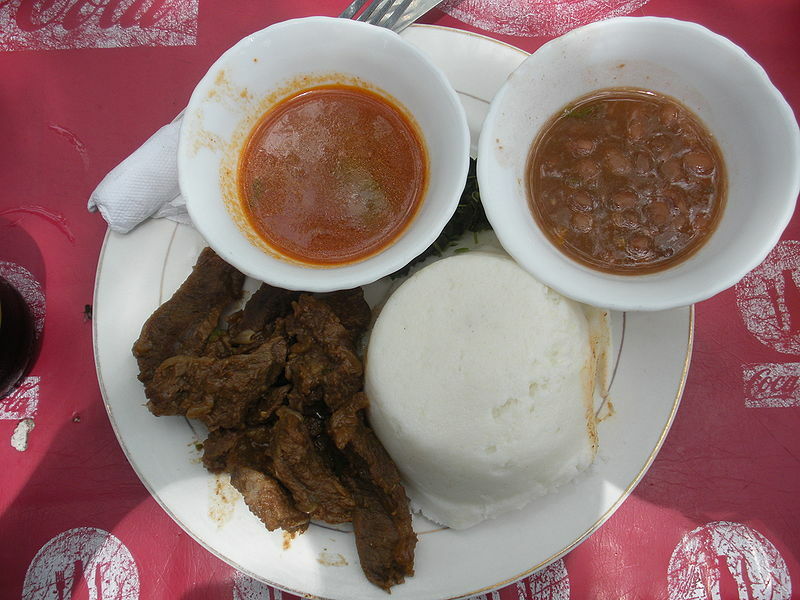 Left: Ugali with beef and sauce. It is commonly made from maize flour and water, and varies in consistency from porridge to a dough-like substance. When ugali is made from another starch, it is usually given a specific regional name. The traditional method of eating ugali (and the most common in the rural areas) is to roll a lump into a ball, and then dip it into a sauce or stew of vegetables and/or meat. Making a depression with the thumb allows the ugali to be used to scoop, and to wrap around pieces of meat to pick them up in the same way that flat bread is used in other cultures. Ugali should be eaten by hand, with some sort of meat and soup. Ugali is relatively inexpensive and is thus easily accessible to the poor who usually combine it with a vegetable stew or meat stews and makes a filling meal. Ugali is easy to make and the flour can last for considerable time in average conditions. Maize from which the flour is obtained is hardy and will grow reliably in dry seasons. For these reasons, ugali is an important part of the diet of millions of people of Sub Saharan Africa. Ugali is similar to fufu from West Africa, polenta from Italy and grits from the southern United States.